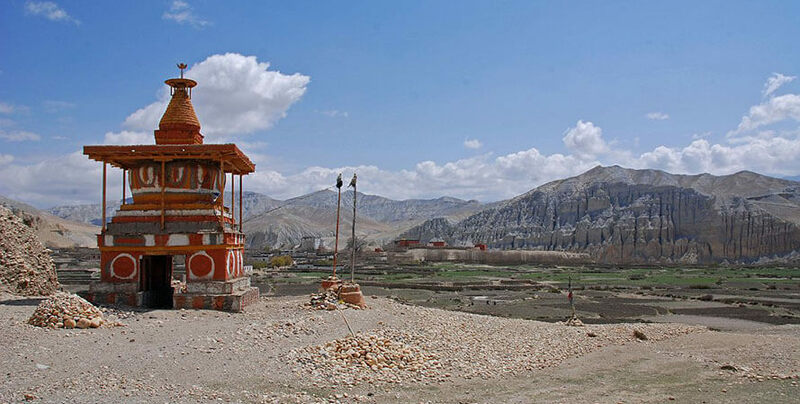 Upper Mustang trekking , the beautiful region of Himalayas, is synonymous with beauty. In the Tibetan language, the word mustang refers to fertile land. Once the capital of the prosperous kingdom Lo Manthang, it now is an isolated and unscathed region, posing the most unique cultures in the world and beauty second to none. 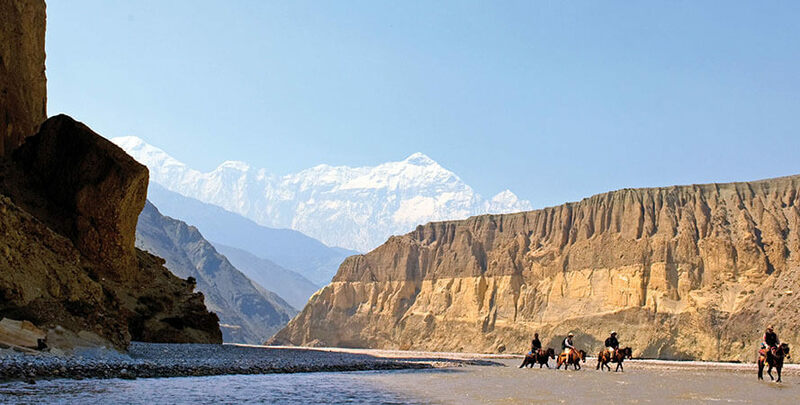 Upper Mustang Trekking is most definitely an unforgettable and once in a life experience. Up until 1992, it was a constrained and demilitarized region which has contributed to the conservation of its culture and natural beauty. Upper Mustang trekking start from Kagabni which is a day distance from beautiful city Pokhara by land transport . We can also fly to Johmsom for around half and hours from Pokhara and trek to Kagbani for three hours, Kagbeni itself is a gorgeous village where Thakali people leaves. 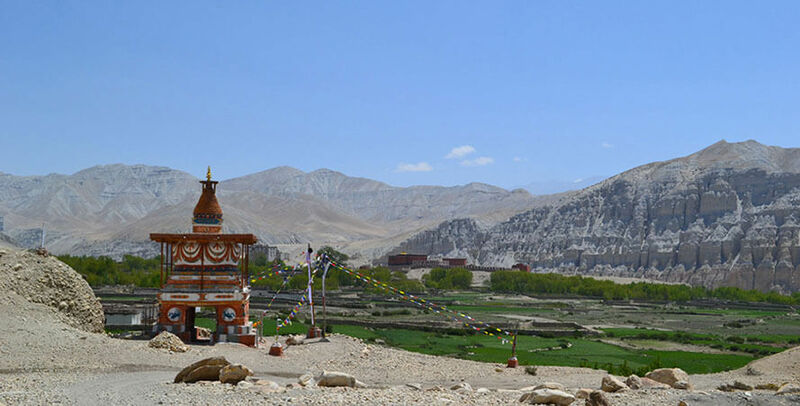 Upper Mustang trek start and end at Kagbeni, the remote area permit is applicable from there. We need minimum of group of two trekkers for Upper Mustang trekking and individual trekkers are not allowed to enter above Kagbeni. The guide is compulsory. 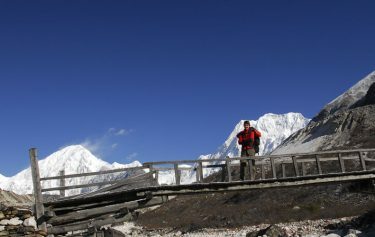 Upper Mustang trekking is relatively easy and any physically fit person can trek this route with ease. The experience and the view of Dhaulagiri and Nilgiri Mountain ranges are very gratifying, among others. 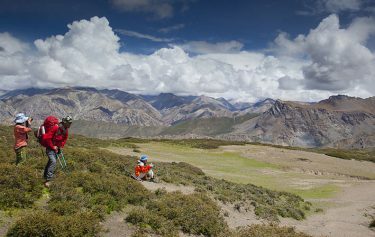 We will trek via the permitted route of the Lo Manthang and reach the max altitude of around 3,800m. Our fifteen days’ itinerary is designed to give you maximum fun, refreshment and adventure to experience living in the Himalayas. 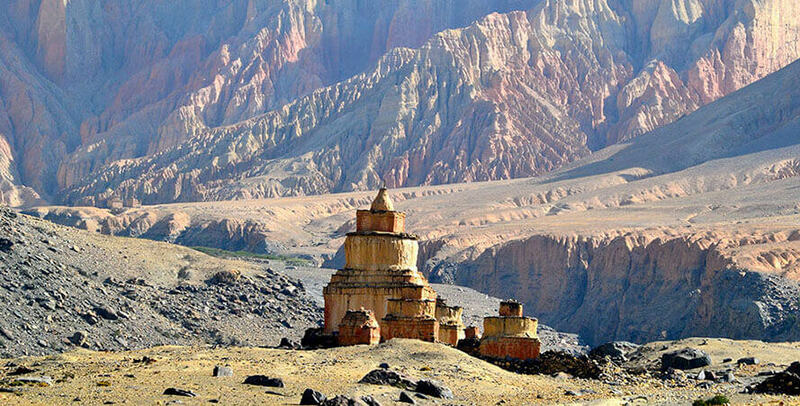 We arrange basic tea house, necessary staff, applicable permit, transportation, arrangements for upper mustang trek and our upper Mustang trekking began from Kathmandu and sand at Pokhara. Day 03: Kathmandu - Pokhara. Day 04: Pokhara - Jomsom- Kagbani. Day 05: Kagbeni - Tsehile (3110 m). Day 06: Tsehile - Syangbochen (3800 m). Day 07: Syambochen - Tsrang (3570 m). Day 08: Tsarang-Lomanthang (3530 m). Day 09: Explore Lomanthang (3760 m). Day 11: Tsarang - Syambochhen. Day 12: Syambochhen - Chuksang (3050 m). Day 13: Chuksang - Kagbeni. Day 14: Kagbeni - Jomsom (2743 m). Day 15: Jomsom - Pokhara. Once you land in Tribhuwan International Airport (TIA), our airport representatives will receive you and take you to your hotel, Transfer to the hotel and free time . Today is a leisure day. We can do some last minute shopping for trekking such as trekking gears and all , can also do city sightseeing as an option. We will travel to scenic city of Pokhara via Prithvi Highway by bus, will be approximately 6 hours long. We can see luscious green hills, dwindling rivers and faraway Himalayans on our way. Pokhara will serve as our gateway to the Annapurna Region. 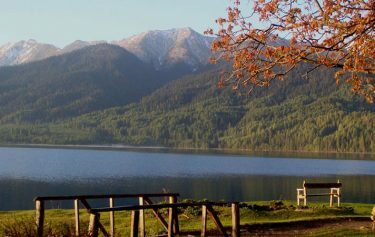 We can travel around this beautiful lake city in the evening or go for boating in the Phewa Lake. Hotel in Pokhara. Early morning drive to airport to board your flight 25-minute flight to Jomsom. Upon arrival in Jomsom we will meet with our crews and proceed toward Kagbeni. 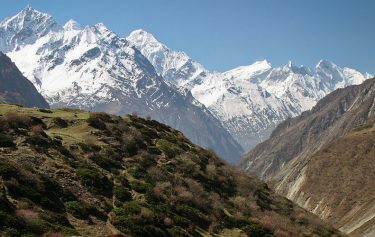 Jomsom is the headquarter of Mustang. We will fly north-west from Pokhara. From Jomsom, we will hike for arounf 3 hours along the bank of Kali Gandaki River to reach the beautiful settlement of Kagbeni, which is also the gateway to Upper Mustang. It is located in the bank of 2 rivers. After breakfast we will proceed toward Tsehile. We will follow the trial of the bank of Kaligandaki, The journey passes through the beautiful settlements of Tangbe and Chunksang. Before we reach, we will cross the Kali Gandaki over the bridge. After climbing through the steep terrain for about 30 minutes we will reach our destination for today. We can see the stunning Nilgiri from here. The trek today is exciting because we will cross 4 passes today, which are Taklam La (3240 m), Dzong La (3550 m), Baga La, Yemdo pass (4000 m). We will also climb a ridge and descend down a gigantic gorge. There are very few families in Syangbochen. We will spend the night in camp. Today, we will gently hike uphill and then cross a pass. There are 4 pass altogether to cross today, which are Shyammochhen La, Nyi or Nya La (4050m), Ghemila (3520 m), Tsarang la (3920 m). After crossing the Nyi La Pass, we will trek downhill for about half an hour and then reach a junction. The right one leads to Charang and the left one leads to Ghami. On our way to Tsrang from Ghemi, we will see the great chorten. There are about 60 families residing in this small village. The trial today will lead us to the driest part of Mustang. The trek today will be a bit tiring. However, we will be gratified with the beautiful view of the Rocky Mountains along the way. Lomanthang is the ancient city of the Himalayans, and there still is a ruling monarch although monarchy has been removed in Nepal. We can visit the Lomanthang Palace, Charang Chu Canyon on reaching our destination. Today is a leisure day or exploration day. We will explore this medieval town which has a very rich history. We shall visit the Namgyal Gompa, which will take us 2 hours. We can also visit Tingkhar, a small village and Champa Lakhang where the largest Buddhist statue is located. We will spend the night in Lo Manthang in an overnight tent. Today we will trek downhill to Tsarang from the same route. The journey today will be fun and not tiring since it is downhill trek. we will stay the night at Tsarang. With Dhaulagiri and Nilgiri in the backdrop, we will hike down to Syambochhen today via the holy Rachen Gompa. Rachen Gompa is of great religious value, since it is believed that it grew by itself in the lap of rocky cave. We will spend the night in camp. Today we will trek down the steep ridges and hills to reach Chuksang. We will trek to Tetang along the way, which is a beautiful village situated between two hills. We will spend the night in overnight camp in a tent. Today we will trek through the Jharkot village and visit the Jharkot Monastery in the region. 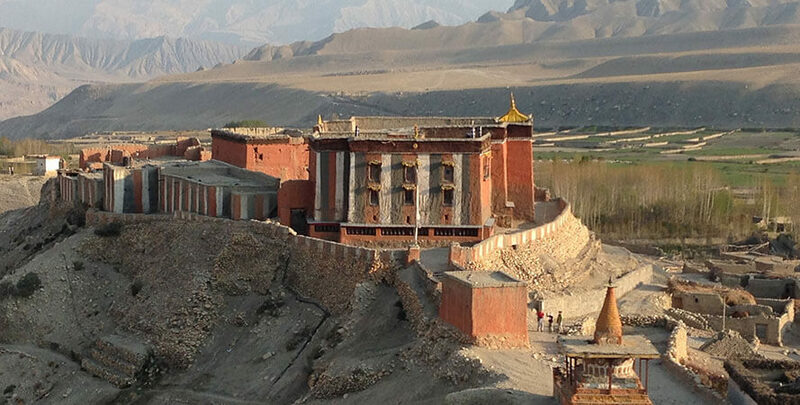 We can also visit the Tibetan Herbal Medicine center and the historical fort of Jharkot. We will trek down to Kagbeni along the banks of Kali Gandaki. Today is the last day of the trek. We will descend to Jomsom and the trek downhill will be relatively easier today. All flights to Pokhara start morning only. We will wake up early and catch a flight to the lake city of Pokhara. Two night deluxe hotel in Kathmandu on B/B, one before and one after the trek. Hotel Access Nepal Pvt.ltd. A professional license Holder Trekking Guide including all his expenses with full insurance cover. Equipment like sleeping bag, down jacket if you do not have your own. First Aid kit box with basic medicine,including Oximeter and pulse meter checker. Emergency Rescue assistance arrangement, pay by your travel insurance. Extra night and meals in Kathmandu and Pokhara. International airfare -Travel insurance (compulsory). We have booked our upper Mustang trek with Subash , Exciting Nepal trek. Subash provided me Guide Basu for our Trek. He is very knowledgeable. All permit and papers were arranged very professionally. Hotel in Pokhara was good near by lake side they provided. All transportation were on time. The day in Pokhara was rainy by we enjoined a lot. Subash recommended us to take road transportation instead of flight to Jomsom which was really a good suggestion in this raining season, which works great. After all I say the company and crew were very professional and recommend this company to arrange their trip. Grade Info: Moderate to Strenuous.